Hankook Tire is one of the fastest growing tire manufacturers in the world. Headquartered in Wayne, N.J., Hankook Tire America Corp. is a technology-focused, market-driven company that markets and distributes a complete line of high performance and ultra-high performance passenger tires, light truck tires, SUV tires, as well as medium truck and bus tires to more than 400 independent dealers through 3000+ retail sales locations in the United States and Canada. 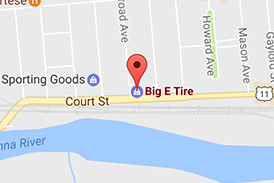 Get A Quote Today on Hankook Tires at Big E Tire and Auto – Browse Hankook Tires Now!